Not to be confused with Yunan. "雲南" redirects here. For other uses, see 雲南 (disambiguation). Yunnan ( 云南) is a province of the People's Republic of China. Located in Southwest China, the province spans approximately 394,000 square kilometres (152,000 sq mi) and has a population of 45.7 million (as of 2009). The capital of the province is Kunming, formerly also known as Yunnan. The province borders the Chinese provinces Guangxi, Guizhou, Sichuan, and the Tibet Autonomous Region, as well as the countries Vietnam, Laos, and Myanmar. "South of the Yun(ling Mountains)"
Yunnan is situated in a mountainous area, with high elevations in the northwest and low elevations in the southeast. Most of the population lives in the eastern part of the province. In the west, the altitude can vary from the mountain peaks to river valleys by as much as 3,000 metres (9,800 ft). Yunnan is rich in natural resources and has the largest diversity of plant life in China. Of the approximately 30,000 species of higher plants in China, Yunnan has perhaps 17,000 or more. Yunnan's reserves of aluminium, lead, zinc and tin are the largest in China, and there are also major reserves of copper and nickel. The Han Empire first recorded diplomatic relations with the province at the end of the 2nd century BC. 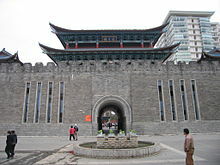 It became the seat of a Sino-Tibetan-speaking kingdom of Nanzhao in the 8th century AD. Nanzhao was multi-ethnic, but the elite most-likely spoke a northern dialect of Yi. The Mongols conquered the region in the 13th century, with local control exercised by warlords until the 1930s. From the Yuan dynasty onward, the area was part of a central-government sponsored population movement towards the southwestern frontier, with two major waves of migrants arriving from Han-majority areas in northern and southeast China. As with other parts of China's southwest, Japanese occupation in the north during World War II forced another migration of majority Han people into the region. These two waves of migration contributed to Yunnan being one of the most ethnically diverse provinces of China, with ethnic minorities accounting for about 34 percent of its total population. Major ethnic groups include Yi, Bai, Hani, Zhuang, Dai and Miao. The Yuanmou Man, a Homo erectus fossil unearthed by railway engineers in the 1960s, has been determined to be the oldest-known hominid fossil in China. By the Neolithic period, there were human settlements in the area of Lake Dian. These people used stone tools and constructed simple wooden structures. Around the 3rd century BC, the central area of Yunnan around present day Kunming was known as Dian. The Chu general Zhuang Qiao (庄蹻) entered the region from the upper Yangtze River and set himself up as "King of Dian". He and his followers brought into Yunnan an influx of Chinese influence, the start of a long history of migration and cultural expansion. In 221 BC, Qin Shi Huang unified China and extended his authority south. Commanderies and counties were established in Yunnan. An existing road in Sichuan – the "Five Foot Way" – was extended south to around present day Qujing, in eastern Yunnan. The Han–Dian wars began under Emperor Wu. He dispatched a series of military campaigns against the Dian during the southward expansion of the Han dynasty. In 109 BC, Emperor Wu sent General Guo Chang (郭昌) south to Yunnan, establishing Yizhou commandery and 24 subordinate counties. The commandery seat was at Dianchi county in present-day Jinning. Another county was called "Yunnan", probably the first use of the name. To expand the burgeoning trade with Burma and India, Emperor Wu also sent Tang Meng [zh] to maintain and expand the Five Foot Way, renaming it "Southwest Barbarian Way" (西南夷道). By this time, agricultural technology in Yunnan had improved markedly. 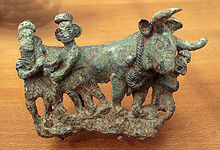 The local people used bronze tools, plows and kept a variety of livestock, including cattle, horses, sheep, goats, pigs and dogs. Anthropologists have determined that these people were related to the people now known as the Tai. They lived in tribal congregations, sometimes led by exiled Chinese. During the Three Kingdoms, the territory of present-day Yunnan, western Guizhou and southern Sichuan was collectively called Nanzhong. The dissolution of Chinese central authority led to increased autonomy for Yunnan and more power for the local tribal structures. In AD 225, the famed statesman Zhuge Liang led three columns into Yunnan to pacify the tribes. His seven captures of Meng Huo, a local magnate, is much celebrated in Chinese folklore. International trade flowed by din of Yunnan. In the 4th century, northern China was largely overrun by nomadic tribes from the north. In the 320s, the Cuan (爨) clan migrated into Yunnan. 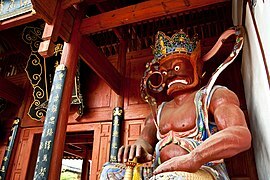 Cuan Chen (爨琛) named himself king and held authority from Lake Dian, then known as Kunchuan. Henceforth the Cuan clan ruled eastern Yunnan for over four hundred years. Before the rise and dominance of the Nanzhao Kingdom around Yunnan in the eighth century, many local tribes, clans, and other groups sprang up. Around Lake Erhai, namely, the Dali area, there emerged six zhao: Mengzi (蒙巂), Yuexi (越析), Langqiong (浪穹), Dengdan (邆赕), Shilling (施浪), and Mengshe (蒙舍). Zhao(诏) was an indigenous non-Chinese language term meaning "king" or "kingdom." Among the six regimes Mengshe was located south of the other five; therefore given the new, larger context, it was called Nanzhao (Southern Kingdom). By the 730s Nanzhao had succeeded in bringing the Erhai Lake–area under its authority. 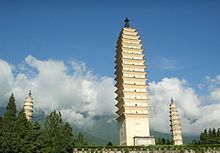 In 738, the western Yunnan was united by Piluoge, the fourth king of Nanzhao, who was confirmed by the imperial court of the Tang dynasty as king of Yunnan. 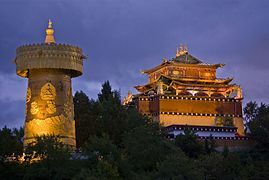 Ruling from Dali, the thirteen kings of Nanzhao ruled over more than two centuries and played a part in the dynamic relationship between China and Tibet. By the 750s, Nanzhao had taken eastern Yunnan into its empire and had become a potential rival to Tang China. The following period inevitably saw conflicts between Tang China and Nanzhao. In 750, Nanzhao attacked and captured Yaozhou, the largest Tang settlement in Yunnan.In 751, Xianyu Zhongtong (鮮于仲通), the regional commander of Jiannan (Sichuan), led a Tang campaign against Nanzhao. Geluofeng regarded the previous incident as personal and wrote to Xianyu to seek peace. Howerver, Xianyu Zhongtong detained the Nanzhao envoys and turned down the appeal. Confronted with Tang armies, Nanzhao immediately turned its allegiance to Tubo. The Tubo and Nanzhao agreed to be "fraternal states"; Geluofeng was given the titles zanpuzhong ("younger brother").The Nanzhao-Tubo alliance finally made Xianyu's expedition became a disaster. Tang China did not give up after one failure. In 753, another expedition was prepared, but this was also defeated by Nanzhao. In 754, the Tang organized an army of more than 100,000 troops that advanced to the Dali plain, resulting in only another slaughter. By the end of the eighth century, Tang was no longer a major threat to Nanzhao. Nanzhao's expansion lasted for several decades. In 829, Nanzhao suddenly plundered Sichuan and entered Chengdu. When it retreated, hundreds of Sichuan people, including skilled artisans, were taken to Yunnan. In 832, the Nanzhao army captured the capital of the Pyu kingdom in modern upper Burma. Nanzhao also attacked the Khmer peoples of Zhenla. Generally speaking, Nanzhao was then the most powerful kingdom in mainland Southeast Asia, and played an extremely active role in multistate interactions. In 859, Nanzhao captured Bozhou, and this event exacerbated the Nanzhao-Tang clashes. When the Tang governor of Annam took Bozhou back in the following year, Nanzhao, with the help of native peoples, occupied Hanoi as the Tang army moved to Bozhou. When the Tang forces returned, Nanzhao troops retreated from Hanoi but attacked and plundered Yongzhou. In the winter of 862, Nanzhao, allying with local groups, led an army of over 50,000 men to invade Annam again. It is reported that the Tang forces lost over 150,000 soldiers (either killed or captured by Nanzhao) in the two Annam battles.The autumn of 866 saw Tang victory in Hanoi and soon all of the Nanzhao forces were driven away. But Tang China had lost its ability to attack Nanzhao. While Nanzhao was being defeated in Annam, it still occasionally attacked Sichuan. In 869, Shilong (世隆), the eighth king and the first empire of Nanzhao, invaded Sichuan. In 874, Nanzhao attacked Sichuan again. In 902, Zheng Maisi, the qingpingguan (清平官,"Prime Minister") of Nanzhao, murdered the infant king of Nanzhao, and established a short-lived regime, namely, Da Chang He. Nanzhao, a once-powerful empire, disappeared. In 937, Duan Siping overthrew the Nanzhao and established the Kingdom of Dali. The kingdom was conquered by the Mongol Empire in 1253 after Dali King Duan Xingzhi defected to the Mongols. The Duans incorporated into the Mongol dominion as Maharajahs of the new province. The Mongolian prince sent to administer the region with them was killed. In 1273, Kublai Khan reformed the province and appointed the Semuren Sayid Ajall as its governor. The Yunnan Province during the Yuan dynasty included significant portions of Upper Burma after the Burmese campaigns in the 1270s and 1280s. But with the fall of the Yuan dynasty in 1368, the Ming dynasty destroyed the Yuan loyalists led by Basalawarmi in the Ming conquest of Yunnan by the early 1380s. The Ming installed Mu Ying and his family as hereditary aristocrats in Yunnan. During the Ming and Qing dynasties, large areas of Yunnan were administered under the native chieftain system. Under the Qing dynasty a war with Burma also occurred in the 1760s due to the attempted consolidation of borderlands under local chiefs by both China and Burma. Yunnan was a destination for Han Chinese during Yuan rule. Colonizers moved into the area during Ming and Qing rule. During the Ming dynasty, 3 million Han Chinese mostly from Nanjing (before the original Nanjing population was largely replaced by Wu speakers) and some from Shanxi and Hebei settled in Yunnan. Although largely forgotten, the bloody Panthay Rebellion of the Muslim Hui people and other local minorities against the Manchu rulers of the Qing dynasty caused the deaths of up to a million people in Yunnan. A British officer testified that the Muslims did not rebel for religious reasons and that the Chinese were tolerant of different religions and were unlikely to have caused the revolt by interfering with the practising of Islam. Loyalist Muslim forces helped Qing crush the rebel Muslims. The Qing armies only massacred Muslims who had rebelled or supported the rebels and spared Muslims who took no part in the uprising. In 1894, George Ernest Morrison, an Australian correspondent for The Times, traveled from Beijing to British-occupied Burma via Yunnan. His book, An Australian in China, details his experiences. The 1905 Tibetan Rebellion in which Tibetan Buddhist Lamas attacked and killed French Catholic missionaries spread to Yunnan. Yunnan was transformed by the events of the war against Japan, which caused many east coast refugees and industrial establishments to relocate to the province. It assumed strategic significance, particularly as the Burma Road from Lashio, in Burma to Kunming was a fought over supply line of vital importance to China's war effort. University faculty and students in the east had originally decamped to Changsha, capital of Hunan. But as the Japanese forces were gaining more territory they eventually bombed Changsha in February 1938. The 800 faculty and students who were left had to flee and made the 1,000 mile journey to Kunming, capital of Yunnan in China's mountainous southwest. It was here that the National Southwest Associated University (commonly known as 'Lianda University') was established. In these extraordinary wartime circumstances for eight years, staff, professors and students had to survive and operate in makeshift quarters that were subject to sporadic bombing campaigns by the Japanese. There were dire shortages of food, equipment, books, clothing and other essential needs, but they managed to conduct the running of a modern university. Over those eight years of war (1937-1945), Lianda became famous nationwide for having and producing many, if not most, of China's most prominent academics, scholars, scientists and intellectuals. Both of China's only Nobel laureates in physics studied at Lianda in Kunming. Thousands of plant, insect and mammal species were described in the 19th century by scientists of the French National Museum of Natural History, Paris, in connection with permanent settlements of missionaries of the Missions étrangères de Paris in north-west Yunnan, among them noticeably Jean-André Soulié and Felix Biet. From 1916 to 1917, Roy Chapman Andrews and Yvette Borup Andrews led the Asiatic Zoological Expedition of the American Museum of Natural History through much of western and southern Yunnan, as well as other provinces of China. The book, Camps and Trails in China, records their experiences. Other notable explorers include Heinrich Handel-Mazzetti; George Forrest; Joseph Francis Charles Rock, who from 1922–1949 spent most of his time studying the flora, peoples and languages of southwest China, mainly in Yunnan; and Peter Goullart, a White Russian who studied Naxi culture and lived in Lijiang from 1940 to 1949. 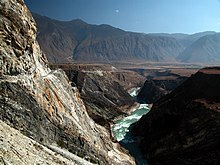 Yunnan is the most southwestern province in China, with the Tropic of Cancer running through its southern part. The province has an area of 394,100 square kilometres (152,200 sq mi), 4.1% of the nation's total. The northern part of the province forms part of the Yunnan–Guizhou Plateau. The province borders Guangxi and Guizhou in the east, Sichuan in the north, and the Tibet Autonomous Region in the northwest. It shares a border of 4,060 kilometres (2,520 mi) with Myanmar (Kachin and Shan States) in the west, Laos (Luang Namtha, Oudomxay, and Phongsaly Provinces) in the south and Vietnam (Hà Giang, Lào Cai, Lai Châu, and Điện Biên Provinces) in the southeast. For practical purposes, all of Yunnan province falls within the Zomia (region) of Asia. Yunnan is at the far eastern edge of the Himalayan uplift, and was pushed up in the Pleistocene, primarily in the Middle Pleistocene, although the uplift continues into the present. The eastern part of the province is a limestone plateau with karst topography and unnavigable rivers flowing through deep mountain gorges. The main surface formations of the plateau are the Lower Permian Maokou Formation, characterized by thick limestone deposits, the Lower Permian Qixia Formation, characterised by dolomitic limestones and dolostones, the Upper Permian basalts of the Ermeishan Formation (formerly Omeishan plateau basalts), and the red sandstones, mudstones, siltstones, and conglomerates of the Mesozoic–Paleogene, including the Lufeng Formation and the Lunan Group (Lumeiyi, Xiaotun, and Caijiacong formations). In this area is the noted Stone Forest or Shilin, eroded vertical pinnacles of limestone (Maokou Formation). In the eastern part the rivers generally run eastwards. The western half is characterized by mountain ranges and rivers running north and south. Yunnan has a generally mild climate with pleasant and fair weather because of the province's location on south-facing mountain slopes, receiving the influence of both the Pacific and Indian oceans, and although the growing period is long, the rugged terrain provides little arable land. See Agriculture in Yunnan. Under the Köppen climate classification, much of the province lies within the subtropical highland (Köppen Cwb) or humid subtropical zone (Cwa), with mild to warm winters, and tempered summers, except in the almost tropical to truly tropical south, where temperatures regularly exceed 30 °C (86 °F) in the warmer half of the year. In general, January average temperatures range from 8 to 17 °C (46 to 63 °F); July averages vary from 21 to 27 °C (70 to 81 °F). Average annual rainfall ranges from 600 to 2,300 millimetres (24 to 91 in), with over half the rain occurring between June and August. The plateau region has moderate temperatures. The western canyon region is hot at the valley bottoms, but there are freezing winds at the mountaintops. The average elevation is 1,980 metres (6,500 ft). The mountains are highest in the north where they reach more than 5,000 m (16,000 ft); in the south they rise no higher than 3,000 m (9,800 ft). 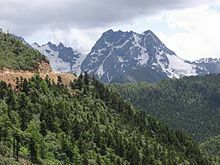 The highest point in the north is the Kawagebo Peak in Deqin County on the Diqing Plateau, which is about 6,740 m (22,110 ft); and the lowest is in the Red River Valley in Hekou County, near the Vietnamese border, with an elevation of 76.4 m (251 ft). The eastern half of the province is a limestone plateau with karst scenery and unnavigable rivers flowing through deep mountain gorges; the western half is characterised by mountain ranges and rivers running north and south. These include the Nujiang (Thai: Salween) and the Lancangjiang (Thai: Mekong). The rugged, vertical terrain produces a wide range of flora and fauna, and the province has been called a natural zoological and botanical garden. Hekou–Lào Cai, by road and rail, is the only Sino-Vietnamese land border crossing open to non-Chinese/non-Vietnamese. Ruili–Muse is the only Sino-Burmese border crossing open to non-Chinese/non-Burmese. Yunnan is the source of two rivers, the Xi River (there known as the Nanpan and Hongshui) and the Yuan River. The Hongshui is a principal source stream of the Xi River. Rising as the Nanpan in eastern Yunnan province, it flows south and east to form part of the boundary between Guizhou province and Guangxi autonomous region. Flowing for 345 km (214 mi), it unites with the Yu River at Guiping to form what eventually becomes the Xi River. the Irrawaddy, which arises from the confluence of two rivers in Kachin State in Burma, has a few small tributaries in Yunnan's far west, such as the Dulongjiang and Taping River, and rivers in the prefecture of Dehong. Yunnan is China's most diverse province, biologically as well as culturally. The province contains snow-capped mountains and true tropical environments, thus supporting an unusually full spectrum of species and vegetation types. The Yunnan camellia (Camellia reticulata) is the provincial emblem. During summer, the Great Plateau of Tibet acts as a barrier to monsoon winds, trapping moisture in the province. This gives the alpine flora in particular what one source has called a "lushness found nowhere else". Yunnan Province has less than 4% of the land of China, yet contains about half of China's birds and mammals. Yunnan is home to, most notably, the southeast Asian gaur, a giant forest-dwelling bovine, the Indochinese tiger and the Asian elephant. Other extremely rare species are the Yunnan box turtle and the Yunnan snub-nosed monkey. It is feared that the Yunnan lar gibbon already is extinct. The freshwater fish fauna is highly diverse with about 620 species, including more than 580 natives (the remaining are introduced). This equals almost 40% of the freshwater fish species in China. Of the Yunnan natives, more than 250 are endemic to the province and many of these are threatened. Several species that are restricted to single lakes (notably Dian, Erhai, Fuxian and Yilong) are likely already are extinct. By far the most diverse order in Yunnan is Cypriniformes; both in total species number and number of endemics. A main source of wealth lies in its vast mineral resources; indeed, mining is the leading industry in Yunnan. Yunnan has proven deposits of 86 kinds of minerals in 2,700 places. Some 13% of the proved deposits of minerals are the largest of their kind in China, and two-thirds of the deposits are among the largest of their kind in the Yangtze River valley and in south China. Yunnan ranks first in the country in deposits of zinc, lead, tin, cadmium, indium, thallium and crocidolite. Other deposits include iron, coal, copper, gold, mercury, silver, antimony and sulfur. More than 150 kinds of minerals have been discovered in the province. The potential value of the proven deposits in Yunnan is 3 trillion yuan, 40% of which come from fuel minerals, 7.3% from metallic minerals and 52.7% from nonmetallic minerals. 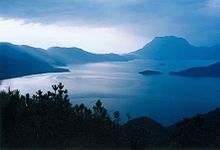 Yunnan has sufficient rainfall and many rivers and lakes. The annual water flow originating in the province is 200 cubic kilometres, three times that of the Yellow River. The rivers flowing into the province from outside add 160 cubic kilometres, which means there are more than ten thousand cubic metres of water for each person in the province. This is four times the average in the country. The rich water resources offer abundant hydro-energy. China is constructing a series of dams on the Mekong to develop it as a waterway and source of power; the first was completed at Manwan in 1993. After four years of drought, in the fall of 2012, winter of 2012-13, and spring of 2013 severe drought was reported which affected flow of springs and the level of spring-fed lakes; agriculture and urban water supplies were also affected. Water levels in Yilong Lake dropped and grass was reported growing in the middle of the lake bed. 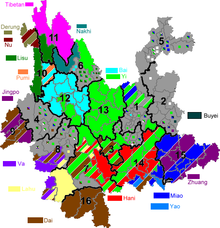 The sixteen prefecture-level divisions of Yunnan are subdivided into 129 county-level divisions (16 districts, 15 county-level cities, 69 counties, and 29 autonomous counties). At the end of the year 2017, the total population is 48.01 million. ^ a b Dongchuan is a satellite urban area separated from Kunming and it is not included in the urban area & district area count. ^ a b New districts established after census: Chenggong (Chenggong County), Jinning (Jinning County). These new districts not included in the urban area & district area count of the pre-expanded city. ^ a b New districts established after census: Zhanyi (Zhanyi County), Malong (Malong County). These new districts not included in the urban area & district area count of the pre-expanded city. ^ a b New district established after census: Jiangchuan (Jiangchuan County). The new district not included in the urban area & district area count of the pre-expanded city. ^ Wenshan County is currently known as Wenshan CLC after census. ^ Mile County is currently known as Mile CLC after census. ^ Mengzi County is currently known as Mengzi CLC after census. 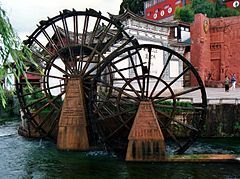 ^ Tengchong County is currently known as Tengchong CLC after census. ^ Formerly known as Luxi CLC until 20 July 2010. ^ Shangri-La County is currently known as Shangri-La CLC after census. ^ Lushui County is currently known as Lushui CLC after census. ^ Shuifu County is currently known as Shuifu CLC after census. Yunnan is noted for a very high level of ethnic diversity. It has the highest number of ethnic groups among the provinces and autonomous regions in China. Among the country's 56 recognised ethnic groups, twenty-five are found in Yunnan. Some 38% of the province population are members of ethnic minorities, including the Yi, Bai, Hani, Tai, Dai, Miao, Lisu, Hui, Lahu, Wa, Nakhi, Yao, Tibetans, Jingpo, Blang, Pumi, Nu, Achang, Jinuo, Mongols, Derung, Manchus, Sui, and Buyei. Several other groups are represented, but they live neither in compact settlements nor do they reach the required threshold of five thousand to be awarded the official status of being present in the province. Some groups, such as the Mosuo, who are officially recognised as part of the Naxi, have in the past claimed official status as a national minority, and are now recognised with the status of Mosuo people. Ethnic groups are widely distributed in the province. Some twenty-five minorities live in compact communities, each of which has a population of more than five thousand. Ten ethnic minorities living in border areas and river valleys include the Hui, Manchus, Bai, Naxi, Mongols, Zhuang, Dai, Achang, Buyei and Shui, with a combined population of 4.5 million; those in low mountainous areas are the Hani, Yao, Lahu, Va, Jingpo, Blang and Jino, with a combined population of 5 million; and those in high mountainous areas are Miao, Lisu, Tibetan, Pumi and Drung, with a total population of four million. CIA map showing the territory of the settlement of ethnolinguistic groups in Yunnan Province (1971). Yunnan's ethnic diversity is reflected in its linguistic diversity. 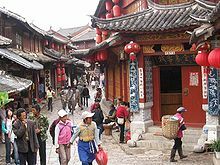 Languages spoken in Yunnan include Tibeto-Burman languages such as Bai, Yi, Tibetan, Hani, Jingpo, Lisu, Lahu, Naxi; Tai languages like Zhuang, Bouyei, Dong, Shui, Tai Lü and Tai Nüa; as well as Hmong–Mien languages. The Naxi, in particular, use the Dongba script, which is the only pictographic writing system in use in the world today. The Dongba script was mainly used to provide the Dongba priests with instructions on how to carry out their rituals: today the Dongba script features more as a tourist attraction. Perhaps the best known Western Dongba scholar was Joseph Rock. 66,000 or 0.1% are Catholics. According to surveys conducted in 2004 and 2007, in those years approximately 32.22% of the province's population was involved in worship of ancestors and 2.75% declared a Christian identity. Most of the population of the province practices traditional indigenous religions including the Chinese folk religion among the Han Chinese, Bimoism among the Yi peoples and Benzhuism among the Bai people. The Dai people are one of the few ethnic minorities of China that traditionally follow the Theravada branch of Buddhism. Most of the Hui people of the region are Muslims. Christianity is dominant among the Lisu, the Jingpo and the Derung ethnic groups. Huating Buddhist Temple in the Western Mountains (Xishan) of Kunming. Guishan Buddhist Temple of the Tibetan tradition. Hall of the Golden Taoist Temple in Kunming. 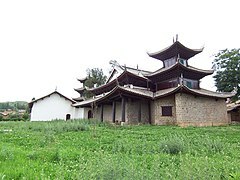 Tuogu Mosque in Ludian County. 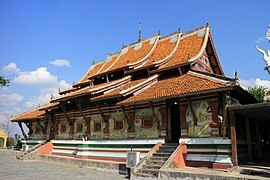 Dai Theravada Buddhist temple in Menghai County, Xishuangbanna. Yunnan produces most of coffee grown in China (although there are also much smaller plantations in Fujian and Hainan. Large-scale coffee cultivation started in Yunnan in 1988. The most commonly grown variety in the province is catimor. Due to China's growing consumption of dairy products, Yunnan's dairy industry is also developing very rapidly and is also aiming to export to its ASEAN neighbors. The flower industry in Yunnan province started to develop towards the end of the 1980s. Yunnan province accounts for 50% of China's total cut flower production. The size of the planting area for cut flowers in Yunnan province amounts to 4000 hectares. In 2003, the output totaled 2.3 billion stems. In 2002 the flower industry in Yunnan had a total output of RMB 3.4 billion. Export amounted to US$18 million. Apart from sales on the domestic market, Yunnan also exports to a number of foreign countries and regions such as Japan, Korea, Hong Kong, Thailand and Singapore. As of the mid-19th century, Yunnan exported birds, brass, tin, gemstones, musk, nuts, and peacock feathers mainly to stores in Guangzhou. They imported silk, wool, and cotton cloth, tobacco and books. Yunnan's nominal GDP in 2011 was 875.1 billion yuan (US$138.92 billion), an annual growth rate of 13.7%. Its per capita GDP was 13,494 yuan (US$1,975). The share of GDP of Yunnan's primary, secondary, and tertiary industries were 17.9%, 43%, and 39.1% respectively. Yunnan is one of the major production bases of copper, lead, zinc, tin and aluminum in China. Gejiu is well known as "the Kingdom of Zinc" with the reserves ranked first in the country. The Yunxi brand refined tin is one of the main products in Gejiu, which is registered on the London Metal Exchange (LME). Besides, reserves of germanium, indium, zirconium, platinum, rock salt, sylvite, nickel, phosphate, mirabilite, arsenic and blue asbestos are also high. Significant copper deposits are found at Dongchuan, iron ore at Wuding, and coal at Xuanwei and Kaiyuan. Economic policy to locate new industry in interior areas with substantial mineral wealth, led to major industrial development in Yunnan, especially in the Kunming area. The electricity industry is another important economic pillar of Yunnan, which plays a key role in the "West-East Electricity Transmission Project". The electricity produced in Yunnan is mainly transported to Guangdong. First established in 1992, Kunming Economic & Technology Development Zone is a national-level zone approved by the State Council. Kunming is located in east-central Yunnan province with preferential location. After several years' development, the zone has formed its pillar industries, which include tobacco processing, machinery manufacturing, electronic information, and biotechnology. The Kunming High-tech Industrial Development Zone (KMHNZ), is a state-level high-tech industrial zone established in 1992 in Northwest Kunming. It is administratively under Kunming Prefecture. It has covers an area of 9 km2 (3.5 sq mi). KMHNZ is located in the northwest part of Kunming city, 4 kilometers from Kunming Railway Station, 5 kilometers from Kunming International Airport. Ruili Border Economic Cooperation Zone (RLBECZ) is a Chinese State Council-approved Industrial Park based in Ruili, Dehong Prefecture, founded in 1992 and was established to promote trade between China and Burma. The area's import and export trade include the processing industry, local agriculture and biological resources are very promising. Sino-Burmese business is growing fast. Burma is now one of Yunnan's biggest foreign trade partners. In 1999, Sino-Burmese trade accounted for 77.4% of Yunnan's foreign trade. In the same year, exports for electromechanical equipments came up to US$55.28 million. Main exports here include fiber cloth, cotton yarn, ceresin wax, mechanical equipments, fruits, rice seeds, fiber yarn and tobacco. Wanding Border Economic Cooperation Zone (WTBECZ) is a Chinese State Council-approved Industrial Park based in Wanding Town, Ruili, Dehong, founded in 1992 and was established to promote trade between China and Burma. The zone spans 6 km2 (2.3 sq mi) and is focuses on developing trading, processing, agriculture resources and tourism. Chuxiong Economic Development Zone is an important zone in Yunnan. Now the zone has attracted a number of investment projects. It is an important industry for the development of new-type industry platform. The zone covers an area of 12 km2 (4.6 sq mi), composed of four parks. First established in 1992, Hekou Border Economic Cooperation Zone is a border zone approved by State Council to promote Sino-Vietnamese trade. It has a planned area of 4.02 km2 (1.55 sq mi). The zone implemented several policies to serve its clients in China from various industries and sectors including investment, trade, finance, taxation, immigration, etc. In higher education, Yunnan has one "National Key University"—Yunnan University in Kunming. There is also a growing number of technical schools, among which the most prominent are the Yunnan Normal University, the Southwest Forestry University, Yunnan Agricultural University, Yunnan Academy of Agricultural Sciences, Kunming Medical University, Yunnan University of Traditional Chinese Medicine, and Kunming University of Science and Technology. Other notable establishments of learning are the Kunming branch of the Chinese Academy of Sciences, the Yunnan Astronomical Observatory, and the Yunnan Provincial Library. As of 2000, there were 24 institutions of higher learning in Yunnan, with an enrollment of over 90,400 students and a faculty of 9,237; 2,562 secondary schools with an enrollment of more than 2,137,400 students and 120,461 teachers; and 22,151 primary schools with an enrollment of 4,720,600 pupils and a faculty of 210,507. The gross enrollment rate of school-age children was 99.02%. The first railway in Yunnan was the narrow gauge Yunnan–Vietnam Railway built by France from 1904 to 1910 to connect Kunming with Vietnam, then a French colony. In Yunnan, the Chinese section of this railway is known as the Yunnan-Hekou Railway and the line gave Yunnan access to the seaport at Haiphong. During the Second World War, Britain and the United States began building a railway from Yunnan to Burma but abandoned the effort due to Japanese advance. Due in part to difficult terrain both locally and in surrounding provinces and the shortage of capital for rail construction, Yunnan remained outside of China's domestic rail network until 1966 when the Guiyang–Kunming Railway was completed. The line would not enter into operation until 1970, the same year that the Chengdu-Kunming was completed. The Nanning–Kunming Railway to Guangxi was completed in 1997, followed by the Neijiang–Kunming Railway in 2001. The Panxi Railway, originally built in 1975 to draw coal from neighboring Guizhou, was electrified in 2001 and adds to eastern Yunnan's outbound rail transport capacity. Within the province, the Kunming–Yuxi, opened in 1993, and the Guangtong–Dali, opened in 1998, expanded the rail network to southern and western Yunnan, respectively. The Dali–Lijiang Railway, opened in 2010, brought rail service to northwestern Yunnan. That line is planned to be extended further north to Xamgyi'nyilha County. The province is extending the railway network to neighboring countries in Southeast Asia. From Yuxi, the Yuxi–Mengzi Railway, built from 2005 to 2013, and the Mengzi–Hekou Railway, under construction since 2008, will form a standard gauge railway connection with Vietnam. The Dali–Ruili Railway, under construction since May 2011, will bring rail service to the border with Myanmar. Also under planning is a rail line from Yuxi to Mohan, in Xishuangbana Prefecture, on the border with Laos. This line could be extended further south to Thailand, Malaysia and Singapore. Roadway in Lijiang with the Jade Dragon Snow Mountain in the distance. Road sign in Xamgyi'nyilha County. A street in Jinghong lined with palm trees. Second-level national highways stretch 958 km (595 mi), third-level highways, 7,571 km (4,704 mi) and fourth-level highways, 52,248 km (32,465 mi). The province has formed a network of communication lines radiating from Kunming to Sichuan and Guizhou provinces and Guangxi and Tibet autonomous regions, and further on to Burma, Laos, Vietnam and Thailand. After the opening of the Suolongsi to Pingyuanjie expressway, Luofu expressway, the first between Yunnan and Guangxi Province, opened in October 2007. It has made material and passenger transportation between the two provinces much more convenient. Moreover, Luofu Expressway has also become the main road from Yunnan to Guangxi and the coastal ports. Luofu Expressway begins from the crossroads of Luo Village between Yunnan and Guangxi Provinces and ends at Funing County of Wenshan State. The total length of the expressway is 79.3 kilometers which has shortened the commute between Yunnan and Guangxi from the previous 3 and half hours to just 50 minutes. In 1995, the province put an investment of 171 million yuan to add another 807 km (501 mi) of navigation lines. It built two wharfs with an annual handling capacity of 300,000 to 400,000 tons each and four wharfs with an annual handling capacity of 100,000 tons each. The annual volume of goods transported was two million tons and that of passengers transported, two million. The province has twenty domestic air routes from Kunming to Beijing, Shanghai, Guangzhou, Chengdu, Haikou, Chongqing, Shenyang, Harbin, Wuhan, Xi'an, Lanzhou, Hangzhou, Xiamen, Nanning, Shenzhen, Guiyang, Changsha, Guilin, Lhasa and Hong Kong; ten provincial air routes from Kunming to Jinghong, Mangshi, Lincang, Tengchong, Lijiang, Dali, Xamgyi'nyilha, Zhaotong, Baoshan and Simao; and ten international air routes from Kunming to Bangkok, Kolkata, Chiang Mai, Yangon, Singapore, Seoul, Hanoi, Ho Chi Minh City, Kuala Lumpur and Vientiane. Replacing Kunming Wujiaba International Airport is Kunming Changshui International Airport, which opened June 28, 2012. Bridge-building in Yunnan date back at least 1,300 years when the Tibetan Empire built an iron chain bridge over the Yangtze to the neighboring Nanzhao Kingdom at what is today Weixi Lisu Autonomous County during the Tang dynasty. Iron chain bridges are still found across high river valleys of Yunnan. The Jinlong Bridge on the Jinsha River in Lijiang remains the oldest bridge over the Yangtze. With the expansion of the highway and railway network in Yunnan, numerous large-scale bridges have been built across the region's myriad of rivers, including the Yangtze which has dozens of crossings in Yunnan. Kunming is the only city in Yunnan that has a metro system. As of October 2018, it has 4 lines in operation. Yunnan has several different tea growing regions. One of Yunnan's best known products is Pu-erh tea (or Puer), named after the old tea trading town of Pu-erh (Puer). The province is also known for its Yunnan Gold and other Dianhong teas, developed in the 20th century. Yunnan Province, due to its landscapes, mild climate and cultural diversity, is one of China's major tourist destinations. Most visitors are Chinese tourists, although trips to Yunnan are organized by an increasing number of foreign travel agencies as well. Mainland tourists travel by the masses; 2.75 million Chinese visited Yunnan last October during National Holiday. Also a different trend is slowly developing; small scale and environmentally friendly ecotourism. At the moment projects in this field are often being set up with help of NGO's. In 2004, tourism revenues amounted to 37 billion RMB, and thus accounting for 12.6% of the provincial GDP. Another fact indicating the importance of tourism in Yunnan Province is capital Kunming hosting the China International Travel Mart every two years. This tourism trade fair is the largest of its kind in Asia and serves as an important platform for professionals in the sector. More than 80 countries and regions were present during the 2005 edition. Tourism is expected to grow further. In 2010, the province welcomed over 2.3 million overseas tourists and the Yunnan Provincial Tourism Bureau aims to draw 4.3 million overseas arrivals under the 12th Five-Year Tourism Development Plan. Kunming city is expected to add 11 new mid- to high-end hotels with an inventory of under 4,000 rooms between 2012 and 2016. The Nature Conservancy and the Chinese government came together to form a partnership and explore the possibility of bringing adventure tourism onto the rivers of Southwest China. A two-month white-water expedition explored from the Mekong River's Moon Gorge to Yangze River's Great Bend. The expedition provided valuable information to the partnership, encouraging them to take into account the safety, culture, economics, and conservation of the Yunnan Province. Creating an adventure tourism sector would bring valuable economic resources to the economically struggling population, who had once relied on logging as income prior to it being banned due to deforestation. Xamgyi'nyilha County (also known as Shangri-La and formerly Zhongdian), an ethnic Tibetan township and county set high in Yunnan's northwestern mountains. Yuanyang, a Hani minority settlement with vast rice-terraced mountains. Xishuangbanna, a national scenic resort, noted for its natural and cultural attractions. Professional sporting teams in Yunnan include the Yunnan Bulls in the Chinese Basketball Association. Football teams include Yunnan Lijiang Dongba and the defunct Yunnan Hongta. ^ "Doing Business in Yunnan Province of China". Ministry Of Commerce - People's Republic Of China. Retrieved 5 August 2013. ^ 云南省2017年国民经济和社会发展统计公报 [Statistical Communiqué of Yunnan on the 2017 National Economic and Social Development] (in Chinese). Yunnan Bureau of Statistics. 2018-06-12. Retrieved 2018-06-22. ^ a b David Paterson, Kunming Institute of Botany’s honorary senior horticulturalist and former director of the Royal Botanic Garden in Edinburgh, Scotland. ^ Lee, James (1982). "The Legacy of Immigration in Southwest China, 1250-1850". Annals de démographie historique. 1982: 279–304. ^ Yang, Bin (2008). "Chapter 2 The Southwest Silk Road: Yunnan in a Global Context". Between Winds and Clouds The Making of Yunnan Second Century BCE to Twentieth Century CE (PDF). Columbia University Press. ^ Dardess, John W. (2003). "CHAPTER 3 Did the Mongols Matter? Territory, Power, and the Intelligentsia in China from the Northern Song to the Early Ming". In Smith, Paul Jakov; von Glahn, Richard. The Song –Yuan-Ming Transition in Chinese History (PDF). Cambridge: Harvard University Asia Center. p. 111. ISBN 9780674010963. ^ Lee, James (1982). "The legacy of immigration in Southwest China, 1250-1850". Annales de démographie historique. 1982 (1): 279–304. Retrieved 11 July 2016. ^ Yunnan Bureau of Geology and Mineral Resources (1990). Regional Geology of Yunnan Province. Geological Memoirs of the Ministry of Geology and Mineral Resources of the People’s Republic of China: Regional Geology, no.21 (in Chinese). Beijing: Geological Publishing House. p. 10. ISBN 978-7-116-00567-9. ^ 中央气象台>> 全国 >> 云南省 >> 景洪天气预报 (in Chinese). National Meteorological Centre of the China Meteorological Administration. Retrieved 2012-06-26. ^ Blanck, Zhou, and McCord (2006). The Yunnan box turtle, Cuora yunnanensis (BOULENGER 1906); historical background and an update on the morphology, distribution and vulnerabilities of the only known living specimens. Sacalia 13(4): 14-35. ^ Grueter, Jiang, Konrad, Fan, Guan, and Geissmann (2009). Are Hylobates lar Extirpated from China? International Journal of Primatology 30:553–567. ^ a b "Dry spell grips Yunnan Province". CCTV. February 26, 2013. Retrieved April 17, 2013. ^ Coco Liu (April 16, 2013). "DROUGHT: What happens when Asia's 'water tower' dries up?". ClimateWire E&E News. Retrieved April 17, 2013. 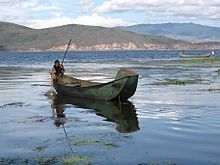 ^ "Yunnan issues Level IV emergency response plan to drought". In Kunming. March 21, 2013. Retrieved April 17, 2013. ^ Zheng Jinran (February 21, 2013). "Home / China / Society Drought affects 660,000 people in Yunnan, Gansu and Hebei". China Daily. ^ Mamta Badkar (March 1, 2013). "660,000 People In China Have Been Living With Almost No Water For Four Years". Business Insider. Retrieved April 17, 2013. ^ "Lijiang is to build Laojunshan National Park". Kunming. 2009-01-09. Retrieved 2013-11-17. ^ UNESCO World Heritage Centre. "South China Karst - UNESCO World Heritage Centre". Whc.unesco.org. Retrieved 2013-11-17. ^ a b c 中国2010年人口普查分县资料. Compiled by 国务院人口普查办公室 [Department of Population Census of the State Council], 国家统计局人口和社会科技统计司编 [Department of Population and Social Science and Statistics, National Bureau of Statistics]. Beijing: China Statistics Print. 2012. ISBN 978-7-5037-6659-6. ^ a b c d e "Qin Guangrong re-elected governor of Yunnan Province". Xinhua. 2008-01-24. Retrieved 2008-02-23. ^ 中国云南省五个民族DYS287位点多态性的调查. Windrug.com. Retrieved 2013-11-17. ^ a b c 毕迎春: 云南省宗教信教群众达400余万人 Archived 2014-07-27 at the Wayback Machine, 2005-7-27. ^ a b "China Economy @ China Perspective". Thechinaperspective.com. 2013-11-13. Retrieved 2013-11-17. ^ "Myanmar to open second largest border trade zone". People's Daily Online. February 13, 2006. Retrieved 2008-10-14. ^ "Literacy Co-ordination Office of Yunnan Province". Portal.unesco.org. Retrieved 2013-11-17. ^ Thomson Reuters Foundation. "Thomson Reuters Foundation | News, Information and Connections for Action". Alertnet.org. Retrieved 2013-11-17. ^ "Article on the tea growing regions of Yunnan". The-leaf.org. 1985-06-11. Retrieved 2013-11-17. ^ "Yunnan catches up". TTGmice. Retrieved 10 December 2012. Jim Goodman (2002). The Exploration of Yunnan. ISBN 7-222-03276-2. Stephen Mansfield (2007). China: Yunnan Province. (Bradt Travel Guide China: Yunnan Province) ISBN 1-84162-169-2. Ann Helen Unger and Walter Unger. 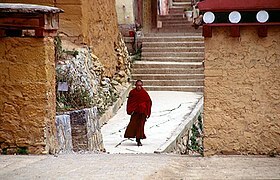 (2007) Yunnan: China's Most Beautiful Province. (Orchid Press) ISBN 3-7774-8390-7. Damien Harper (2007). China's Southwest. (Lonely Planet Country & Regional Guides) ISBN 1-74104-185-6. Patrick R. Booz (1998). Yunnan. (Odyssey Passport: McGraw-Hill Contemporary) ISBN 0-8442-9664-3. Susan K. McCarthy (2009). Communist Multiculturalism: Ethnic Revival in Southwest China (University of Washington Press) ISBN 0-295-98909-2. Tim Summers (2013), "Yunnan - A Chinese Bridgehead to Asia: A case study of China's political and economic relations with its neighbours" (Chandos) ISBN 978-0-85709-444-5.